I have created this page in order to share information with other owners of these comparatively rare high precision Swiss lathes, or those that are interested in them. 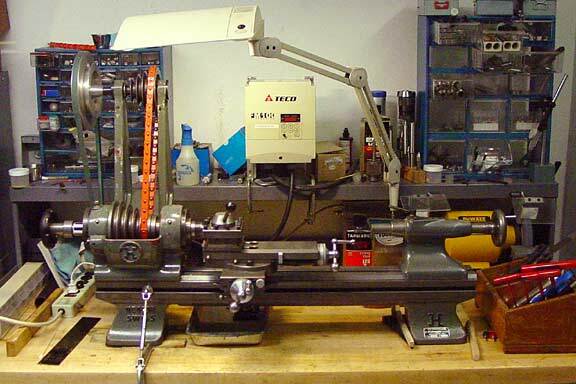 I purchased the lathe pictured above in August 2002 from Dempsey & Co., through an eBay auction. UPDATE 11-03-2009: I am planning to completely revise and update the section of this website regarding Habegger and Schaublin lathes. Check this page periodically to see the updates. UPDATE October 2003: My tooling package for this lathe is now finally nearly complete. It took a year of non-stop searching. I now have a Tripan tool post set, a grinding head (202-87.550), and an inclinable headstock with vertical side. (102-87.350). The grinding and milling attachments are powered by a custom modified Sherline DC variable speed motor. I also have the now discontinued geared thread cutting attachment, which I purchased from Dr. David Samways of Anglo-Swiss Tools, UK, one of the best sources for used and hard to find Schaublin accessories. UPDATE 4-30-2003: I have just purchased a German made Prazi II Wabeco F1200E mill to work with the JH 102 Lathe. I have also added my own custom DRO system. Look for more info on it later on. E-mail me if you have any Prazi or Wabeco accessories you want to sell. After receiving the lathe, I dissasembled it and thorougly cleaned it, removing all old oil/grease and corrosion. This revealed the fine hand-scraped cast iron surfaces, which were then protected with a phosphate rust preventative and Boeing T-9 oil. The motor was also completely overhauled by a local motor shop. The motor is hidden behind the lathe headstock and cannot be seen in this photo. I replaced the old “brammer” link belt with a new Fenner Nu-T-Link belt (the orange belt in the photo). The cross slide in the photo is actually a Schaublin 102 extended length cross slide, which I added to replace the original Habegger cross slide which I am still refurbishing. The toolpost in the photo is a Revolvex four position toolpost. I recently switched to a Tripan 111 quick-change toolpost. I’ve also added two Alina, and one HR Swiss watchmaker lathe chucks. The Habegger JH 102 lathe is a “clone” of the Swiss Schaublin SV 102 lathe, which is highly sought after by watchmakers and precision instrument makers. I also own a Schaublin 102N-80 which you can see here. I became interested in the these lathes because they meet my exacting requirements for accuracy, and their size is right for my needs. From what I have been told, J. Habegger was an employee of the Schaublin factory who struck out on his own and made a very similar lathe, compatible with many Schaublin parts and accessories. Although this story has not been verified, it is widely known. All the accessories for the Schaublin 102 will fit the JH 102. I have used both cross slides and tailstocks from the SV 102 on the JH 102. Habegger also made a JH 70 model similar to the Schaublin 70 lathe. However, the JH 70 has a scaled down version of the JH 102 bed, rather than the “square sided” Schaublin 70 bed, and tailstocks are not interchangeable between the Schaublin and Habegger 70 models. I use my lathes to make parts for motion picture cameras. I had been able to make small parts to tight tolerances, with care, on my Sherline 4400 miniature lathe. The Sherline is the lathe I learned on, and it is excellent for working on very small parts, but it is not designed to work on larger workpieces, or tough materials like Stainless Steel. The largest chuck available for the sherline is 3.1 inches. The Sherline is meant for hobby and very light industrial use, and is geared toward users whoose average size for turning steel would be about one inch diameter, and who work on aluminum and brass parts up to three inch diameter. My limitation was that it had to fit on a 36 x 60 inch workbench, and it had to be no heavier than 300 lbs (136 Kg). This limitation was created by my existing workspace, which is a 10 x 12 foot room in a 1000 square foot apartment. Not the ideal workspace, but it allowed me to put my money into the business and grow. I will hopefully be moving to a larger house in the next few months. I mention the above because if you are a model engineer or other hobbyist and you think you cannot have a large lathe for space reasons, a Habegger or Schaublin 102 bench mount is one of the best choices you can make. The Habegger works out perfectly for my needs. It has a 102mm center height (exactly the same as the Schaublin 102), so the swing is 8.03 in [204mm]. The distance between centers is just under 18 in [450mm]. The lathe came equipped with a 0.8 HP 220V 3-phase AC motor. The Habegger has a modular construction. The headstock, tailstock and cross slide come off easily. When the Habegger lathe is disassembled, there is no component of it that I cannot lift myself. The largest and heaviest part, the lathe bed, weighs approximately 80 lbs. The complete lathe weighs about 200 lbs. The Habegger JH 102 is beautifully made with all the bearing surfaces hand scraped. This includes the Lathe Bed, the undersides of the Lathe Head and Tailstock, and the Compound Slide Ways. The accuracy of the JH 102 Lathe Head is amazing. It has two large Swiss made ball bearings in the back, and a large hand scraped bronze bearing in the front. Measured just ahead of the bronze bearing (just behind the spindle threads) the spindle runs (no load) within 0.002 mm – 80 millionths of an inch! The nameplate reads Type: 1/55/20. The “1” refers to the Type 1, 102mm plain turning lathe, the “55” is the “WTE No.”, or variant (bench mounted, with 5-step pulley for v-belts), and the “20” refers to the collet size of W 20. Toolpost Revolvex 4-position rotating toolpost, or Tripan 111 quick-change toolpost. Both are Swiss made and designed for 10mm square tool bits. 3/8 in tool bits work fine. NOTES: This motor does not seem to match any current IEC frame dimension, but the closest match is IEC D71 which has the same diameter shaft and mounting dimensions of A = 112mm B= 90mm PS stands for pferdestarke (metric horsepower) 1 PS = 0.9863 HP. The Fluxmaster 100 converts my 208V AC house current into 208V 3-phase AC, and allows me to vary the speed of the motor electronically. It cost less than a rotary phase converter and does the same job, plus variable speed control. I tried driving the lathe spindle directly from the motor, rather than using the countershaft. This makes the lathe more compact, but there was not enough torque at low rpm when the speed was reduced by reducting the frequency of the current fed to the motor below about 50 Hz. I am now using the original countershaft system, which can be seen in the above photo. It is possible to quickly change speed ranges by moving the orange belt to different pulleys. If you have any information on this lathe, or have any tooling or accessories for either the Habegger or a Schaublin 102 that you would like to sell, please contact me (Jorge Diaz-Amador) using the information below. W-20 Tooling: Collets, Centers, Arbors, Shanks, etc. Centers (dead and live) with 2º taper used by Habegger. These look like Morse Taper 1, but will fit loosely into a MT1 taper socket. Faceplates with W20 Spindle Nose (37.75 x 3.0mm Habegger/Schaublin spindle thread). Habegger lathe page on shaublinlathe.co.uk (Dr. David Samways) Also supplier of used Aciera, Schaublin, Mikron and other fine Swiss lathes and mills, plus accessories. Habegger lathe page on lathes.co.uk (Tony Griffiths). Also supplier for information and manuals for various lathes, and suppier of the Fenner Nu-T-Link belt.